Compositum FLEX MH™ - flex material available in two hardness: 75A and 80A, dedicated for industrial and professional applications, open and closed FDM 3D printers. One of the biggest advantages of the FLEX MH™ material is its excellent cohesion with ABS Compositum™ - which, when used with dual-head printers, allows you to produce unprecedented details in FDM technology that are a hybrid of flexible FLEX MH ™ material and rigid Compositum ABS materials. This material contributes to 3D FDM printing new possibilities of producing details requiring variable degrees of stiffness in the volume of detail, available so far only in the segment of high-budget PolyJet printers. The 75A hardness variant is one of the largest flex materials available for FDM 3D printing, and the 80A complements applications where more hardness is required. Additionally, FLEX MH™ filaments are extremely easy to print - they are easily printable with fill speeds of 70mm / s and there is no threading phenomenon, typical for elastic materials. 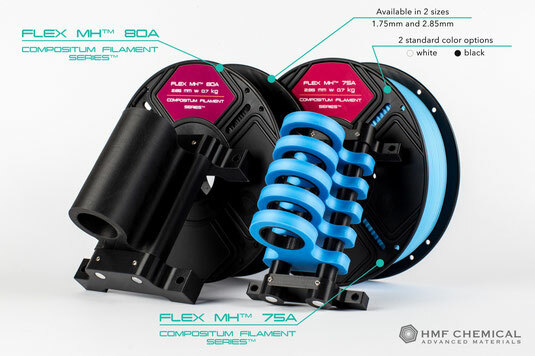 FLEX MH ™ filaments, like the entire Compositum filament family, are characterized by a low degree of volatile matter release and very low moisture absorption, so that no need to use moisture-absorbing substances.